Nightfall doesn’t have to put a damper on your family’s enjoyment of the outdoors. High-impact lighting schemes optimize the use of your yard—allowing you to relax, gather or entertain any time of day. Depending on your needs, G.A. Landscape experts can illuminate your patio and entertainment space, install task lighting for your outdoor kitchen, improve the safety of your swimming pool, or create a charming seating area. A properly lit yard or patio enhances nighttime curb appeal, welcoming guests and making residents feel at home. Carefully planned lighting is also integral to exterior security. The best security lighting deters trespassers and intruders by improving visibility and minimizing shadowed areas. Finally, a professionally installed outdoor lighting scheme should illuminate landscape features and tripping hazards so adults, children and pets can safely navigate stairs, paths and walkways. G.A. 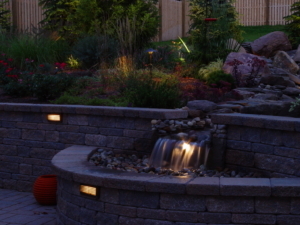 Landscape is one of the area’s leading landscape consulting, design and construction firms. Based in Westfield, we provide lighting installation and outdoor living expertise to discerning clients across NJ. Trust our trained and certified team for your landscape design, landscape construction, drainage and grading solutions and full-service property management. To schedule a landscape lighting consultation, call 908.789.1859. New and returning clients can also connect online and a member of the G.A. Landscape team will be in touch promptly to answer your questions. We’re cultivating lasting relationships with happy clients.